The Plaza de Castilla is a great plaza in the North of Madrid and is bisected by paseo de la Castellana, one of the main thoroughfares of the capital. Here you will find the Torres KIO, two towers tilted 15 degrees from the vertical with a height of 374ft and 26 floors. 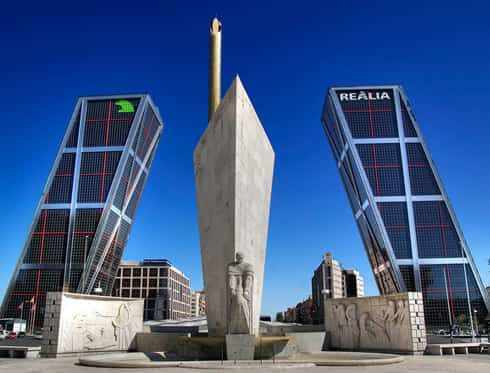 Close to Torres KIO is located the Obelisco de Caja Madrid, a golden obelisk built by Santiago Calatrava that marks the 300th anniversary of Caja Madrid’s foundation.